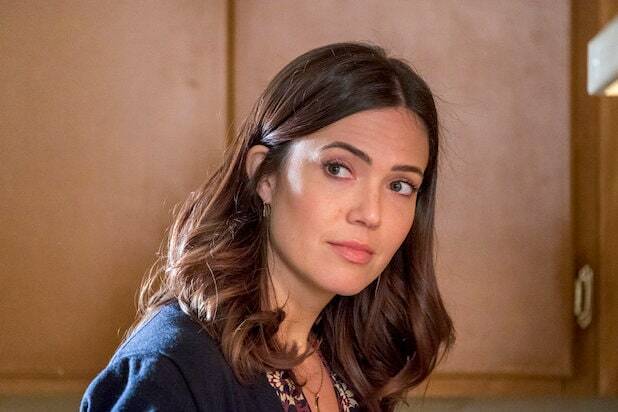 “This Is Us” offered up a seriously dark family reunion during Tuesday’s episode, “Songbird Road: Part One,” when the Big Three were introduced to their Uncle Nicky (played in the present by Griffin Dunne and in the past by Michael Angarano) — Jack’s younger brother who they definitely all thought died in Vietnam, because that’s what Jack told them their whole lives. It turns out that explosion we heard at the end of the midseason finale in November was the result of Nicky “fishing” with a little Vietnamese boy, by throwing grenades over the side of a small rowboat. When one landed inside the boat rather than in the water, Jack’s little brother was unable to get the child out in time — but did dive out to save himself. The little boy died and Nicky was sent home from the war, catatonic, before he could tell Jack it was an accident. Jack was unable to forgive Nicky for this moment and ignored his postcards — addressed from Clark Kent — for years, until one day when the Big Three were preteens, he drove to meet his brother in his trailer just a few hundred miles away in Bedford, Pennsylvania. Jack had a short, awkward chat with Nicky before telling him he could no longer contact him, as he had a family now and wanted to move on. He then left, and though he briefly considered turning back, he ultimately chose to shut his brother out from that day forward, leaving the Pearson kids to go find him as adults on tonight’s episode, when they discovered his existence all these years later. While Ventimiglia’s character may be dead and unable to answer for the lie he told his family — and why he told it — TheWrap was able to speak to “This Is Us” co-showrunners Isaac Aptaker and Elizabeth Berger about what Kevin (Justin Hartley), Randall (Sterling K. Brown) and Kate (Chrissy Metz) learned when they met their uncle tonight — and when they returned hours later to find he was about to commit suicide, what Rebecca (Mandy Moore) will learn about her brother-in-law on the next episode, and when fans will learn what the heck is going on in the future timeline. Read our Q&A below and check out what Ventimiglia told TheWrap about the episode here. TheWrap: The next episode — based on this one being called “Songbird Road: Part One” — I’m assuming is called “Songbird Road: Part Two.” Where are we going from here in that episode? Elizabeth Berger: Yes it is. (laughs) It is really a two-parter. Isaac Aptaker: And we’re going to directly pick up literally in that moment where they arrive and see him sitting there with the gun and see what our siblings decide to do with their uncle. And we also see how Rebecca reacts to this news. They’re obviously going to fill her in, and tell her that they’ve found Nicky, and he’s alive in this trailer. And she is going to have many a question and want to see this man. So we’ll be exploring the effects that this revelation has on the entire family. Berger: Yes, and we’re also going to be dealing with sort of how our adult siblings and Rebecca grapple with learning information about Jack and Jack’s past and his history with his brother that they had no idea about, which is obviously going to leave them a little bit shook up. Aptaker: Yeah, they’ve all really learned that their father has been telling them this pretty major lie for his whole life. TheWrap: And does Rebecca in particular feel betrayed knowing what she knows now? Berger: I mean, I think she always knew there was a part of Jack’s past and this history he did not want to delve into. And I think a part of her always knew there was a lot going on beneath the surface she had no idea about and she sort of accepted that because it seemed to be what her husband needed and he was such a great husband and father in so many ways. But I think it’s still obviously very painful to deal with the reality that there was more going on than she could have even dreamed about. TheWrap: Are we supposed to believe now Jack never told anyone about Nicky? Aptaker: Yeah, I think it’s safe to say if he’s not confiding in Rebecca this is something he’s kept to himself. TheWrap: And that was the last time he ever saw Nicky and ever spoke to Nicky? Berger: Yeah, in our minds that was sort of the end of that chapter. It was the end of Jack getting the letters, it was the end of Nicky keeping tabs on Jack. It was such a painful interaction for both of them that they both really went in separate directions in a whole new way from that point on. Aptaker: Yeah, we see in this episode that Nicky doesn’t even know that Jack’s passed away, so we get the sense he’s stopped sending any kind of correspondence or keeping up with how Jack’s doing. TheWrap: Nicky is presumably about to take his own life in the end of the episode until the Big Three show up. Is that because he found out Jack is dead? Is it the emotion of meeting his niece and nephews for the first time? What is it that pushes Nicky to that? Aptaker: Yeah, I think it’s all of that. I think it’s a really, really complicated wave of emotions washing over this guy who is not all that equipped to handle them and not the most mentally stable person to begin with. Learning his brother was dead, learning he’ll never get any closure there, that Jack will never know that what happened was an accident, really knowing that he has this family and has never been a part of their lives, never gotten a chance to know them. It’s just, you can imagine, it’s a wave of all kinds of emotions — bittersweet, sadness. And it’s just too much for him to handle. TheWrap: Are the Big Three going to bring Nicky back to Rebecca or is she coming to him? Berger: That you will have to wait and see, but Rebecca is definitely going to get a chance to ask Nicky questions and to sort of delve deeper into exactly what the past was like between Jack and Nicky. TheWrap: Will we go back in time and see what Nicky has been doing this whole time since the last time Jack saw him? Aptaker: There’s no immediate plans for that. But you know our show, we love to jump around and to pop into random times. So that’s not to say we won’t in the future. TheWrap: Sterling told me last week that by the end of the season we should know why they are going to see Rebecca in the future. Is that correct? And how soon are we going back to the flash-forward? Berger: Yes, we don’t want to say exactly when we’ll be in that time period again, but we will be revisiting it within the season and we will be giving more answers. So hopefully we’ll be revisiting it in a very satisfying way throughout the season. TheWrap: OK, so before the end of the season and when we go back to the future again, will we be seeing a future version of one of the characters that we haven’t seen an older version of yet? TheWrap: Can you tease who that will be? TheWrap: Is it another member of the Big Three, possibly? Aptaker: Maybe? We know people are very, very excited to see how they all turned out in the future. We have it all planned out. But it’ll be appropriately really satisfying in passable time — but I’m not gonna say what happens. TheWrap: OK, back in the present day timeline, how long will it be until Kate delivers the baby? Aptaker: Yeah, if you look at our seasons, in our present day stories we tend to follow a pretty typical calendar. So if you count when she got pregnant that puts her due roughly toward the end of our season. TheWrap: Last week’s episode we ended with Randall finding out he’s won the Philadelphia city council race, and we didn’t have a lot of time to process that this week because of the Nicky stuff. So will be be coming back to that soon and will we see how that affects Randall and Beth going forward? Because people are still concerned about what’s happening with them in the future timeline. Berger: We’re definitely coming back to it. We’re going away from it for a couple weeks but then we’ll be back. And yes, definitely, now that he’s actually won this thing it’s not like the schedules of their lives are going to get any easier. If anything they are going to get only more hectic so of course we’re going to see you know how this affects their marriage and how they approach figuring out a balance to Randall’s work life and his home life and Beth searching for her new job. So there’s a lot brewing for the two of them. TheWrap: Jack almost went back for Nicky after initially leaving and then didn’t — but Kevin did decide to go back after they had left. And Kevin has no idea his father was considering going back. Why did Kevin make the decision to return when his father couldn’t? Aptaker: No, he doesn’t know that his father did that, but I think it speaks to the bigger picture of how Jack and Rebecca raised their children. What I love about that moment is, here you have an episode where a lot of people I think are going to be pretty frustrated with Jack and how he abandoned Nicky and can’t look back. And I agree, that’s a very flawed decision in a flawed human man. But what speaks to what Jack did so right in a much grander sense is he raised his son Kevin, who didn’t make the same decision, who couldn’t leave a family member there like that in what he perceived to be real peril. So in the bigger picture sense, Jack was able to raise children who didn’t repeat his mistakes and one-upped him in a sense. In a very dark episode there is a real optimism and hope to that that was important to us. TheWrap: If Jack had known that what happened with Nicky that was an accident — because he wouldn’t really let Nicky talk about it or explain — if Nicky had told him and if they had that conversation, do you think Jack would have changed his mind and things would have gone differently between them? Berger: That is a good question. Obviously, we don’t know for sure and it’s really hard to say, because I think even if Nicky had spoken those words, it’s so hard for Jack to exist in gray areas. It’s sort of one of his only shortcomings as a man is that things are really black and white for him, really good and bad. And I think it was such a painful chapter of his life with so much horror and heartbreak and disappointment in himself that he wasn’t able to turn Nicky around that I’m not sure having heard those words would have ultimately made that much of a difference. But I don’t know. Aptaker: I agree. I think it’s just as much about Jack feeling his own failures to save his brother as it is about what Nicky did. And Jack is a guy who compartmentalizes, he closes parts of himself off as a survival mechanism to move forward. And I don’t think he had it in himself to reopen that part of his life and that relationship without just totally crumbling.